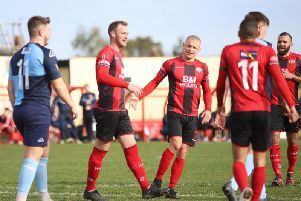 Kettering Town are facing a selection crisis ahead of one of their biggest games of the season so far. The Poppies had no fewer than five players missing due to a virus that is sweeping through the club as they suffered a surprise 1-0 defeat at Stamford in the second qualifying round of the Buildbase FA Trophy last Saturday. And boss Marcus Law, who has been struck down by the illness as well, delivered a worrying update on the situation as Kettering turn their attention to this weekend’s trip to Royston Town in the Evo-Stik League South Premier Division Central. The Poppies sit top with Royston four points behind them in third place while second-placed Stourbridge are the visitors to Latimer Park next Tuesday night. It looks to be a pivotal few days for Kettering’s season but Law is simply hoping he has enough players to field a team this weekend. Asked what the situation is at the present time, Law said: “It’s not good. “We are keeping everyone away from each other in the early part of the week and we will have to see how we all are ahead of the game on Saturday. “As it stands, it will be a case of whoever is showing signs of being fit will more than likely start. “We have clearly picked this up from somewhere but it has swept through the ranks from board members, to management staff and to the players. “It’s obviously not ideal but it happens. “I haven’t experienced anything on this scale though. There have been times when I have had one two with illness but I have never seen a situation like last weekend when such a large chunk of a squad has been affected by it. “I think the illness played a part in the reasons why we lost the game last weekend and now we are just hoping things clear up before this Saturday.